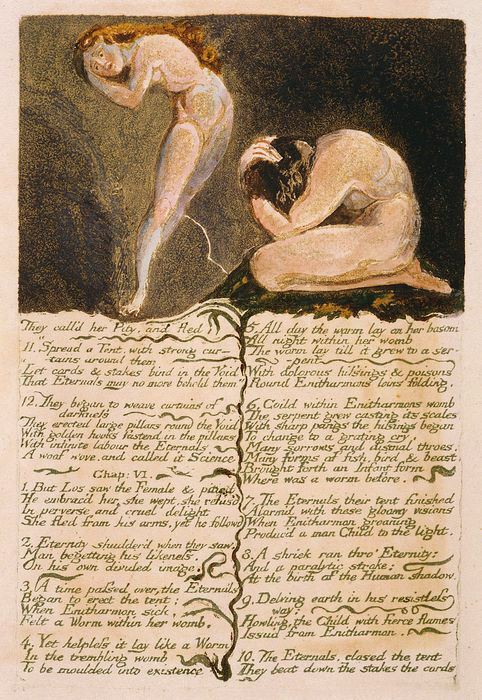 Blake is virtually unique in European art for the way in which image and poetry are married in his visionary prophetic books. Early in his professional life Blake hit upon a novel method for printing his own books from etched copper plates, where hand written text and images could be combined. He continued to use this throughout his life, and most of his major works were published in this way. The method itself is fascinating, not least for the many parallels it has with contemporary publishing technology. 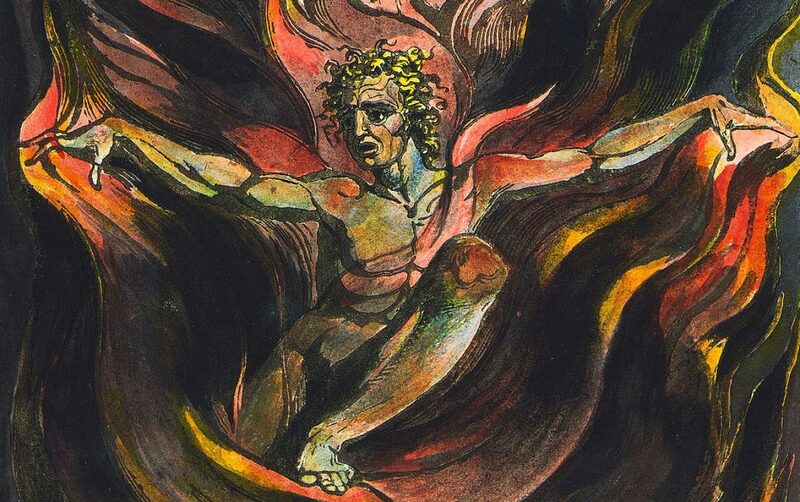 But it also, by analogy, tells us a great deal about the nature of the turbulent, fiery universe of Blake’s Prophetic Books. He always claimed that the method appeared to him in a vision, where his dead brother Robert revealed how it should be done. This was the method. He worked directly onto a copper place, using a camel hair brush to paint the letters and images in a mixture of salad oil and candle-grease. The plates were then etched in an acid bath. The acid bit into the copper except where the layer of candle-grease lay, and, over three or four hours gradually revealed the words and text as ridges of copper standing above the etched surface. From these plates he could produce as many impressions as he wished, in his own home, when orders were placed. They would then be finished with coloured inks, if the buyer so desired. But first the notion that man has a body distinct from his soul is to be expunged; this I shall do by printing in the infernal method, by corrosives, which in Hell are salutory and medicinal, melting apparant surfaces away, and displaying the infinite which was hid. If the doors of perception were cleansed every thing would appear to man as it is, infinite. Looking forward to seeing the whole article in its full infernal glory.